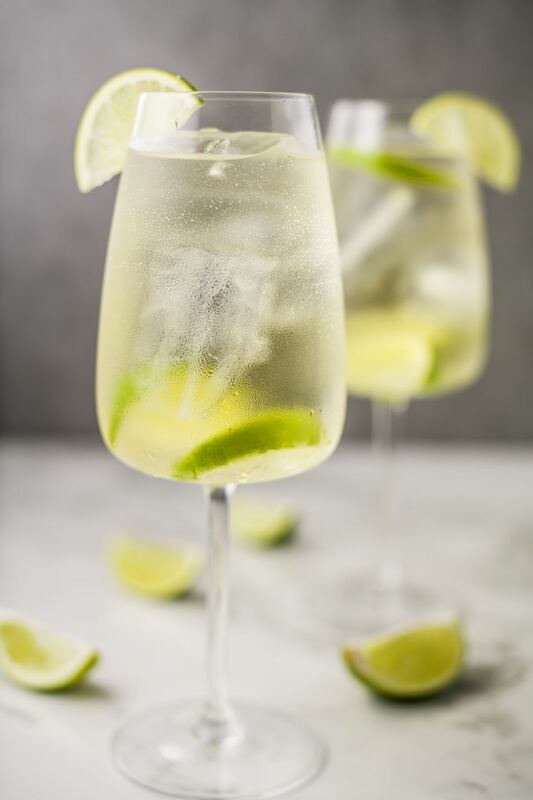 The White Wine Spritzer is a classic drink and one of the easiest cocktails you can mix up. It requires just two ingredients and is a fantastic way to dress up and add sparkle to any still white wine. The key to a great spritzer is to make sure your wine and sparkling water are as cold as possible. This creates a refreshing cocktail that really opens up the aromatics of the wine. It can also make an otherwise not-so-impressive wine enjoyable. While you can vary the ratio to fit your taste and a particular wine, it's often best to begin with a 3:1 pour. This means you'll pour 1 part soda or water for every 3 parts of wine. The White Wine Spritzer is an uncomplicated drink but it's also a nice foundation for a few enhancements. With the right garnish or some fruity ice, it can be just as impressive as any other cocktail. The best part is that its ease makes it a fantastic option to serve at a brunch, bridal shower, book club, or any small, intimate gathering. Fill a white wine glass or highball glass with ice. Top with club soda or mineral water. Garnish with a lime wedge or orange peel. The true beauty of the spritzer is that it will work with any white wine varietal you have on hand. Though Reisling, Pinot Grigio, and Sauvignon Blanc are used most often, you'll also find that a Chardonnay or Gewurztraminer are nice as well. The spritz of the spritzer comes from a clear sparkling water or soda. Your options are just as varied as they are with the wine. Sparkling water or mineral water are nice, clean options. For a hint of fruit, try one of the lightly flavored sparkling waters that are everywhere nowadays. The flavor options of brands like LaCroix offer some very fun spritzer possibilities. On the flip side, you can also opt for a soda. Club soda is a popular option that enhances the aromatic notes of the wine without altering the flavor too much. If you'd like to sweeten up the wine, ginger ale or a lemon-lime soda are good choices. Yet, you can also try out some of the newer boutique sodas which tend to be a little drier. Give brands like Q Drinks and Fever Tree a try. Each of these is designed for mixed drinks and they are as impressive as any wine, making them a perfect match for any spritzer. Feel free to play with their flavors as well. For instance, Dry Sparkling offers lavender, rhubarb, and cucumber sodas that would be most interesting paired with a white wine. You might say that ice is the third ingredient in the spritzer and it does not have to be boring, either. Small touches can make a big impact, so feel free to play around with your ice. It can be something as simple as freezing herbs or edible flowers in your ice cube trays. Borage is a fun one and the delicate blue flowers look fantastic when trapped in ice. They also add a hint of cucumber to the drink as they melt. Rosemary, lavender, mint, and many other herbs are delightful as well. You can also use fruit to enhance your spritzer. Small berries can be frozen in ice or you can freeze fruit without water. Keeping frozen grapes in the freezer is a fantastic idea and offers a quick way to chill any wine drink with no dilution. Melon balls are also a fun option and a great way to use up leftovers after a family picnic. For a very fun treat, stick a frozen fruit pop in your spritzer. This is great for summer and the longer it takes you to drink it, the more fruit will infuse into the drink. Make sure your glass is wide enough to fit the ice pop and place it top side down. The stick also lets you stir as you see fit. Berry, peach, and mango ice pops add a nice splash of flavor and they're easy to make at home. If you want to add a boozy kick, you may even think about creating poptails for your spritzers. How Strong Is the White Wine Spritzer? As you might imagine, the White Wine Spritzer is a very mild mixed drink. The only alcohol in it is wine, which tends to range from 8 to 14 percent ABV. For example, when a 10 percent ABV wine is watered down in the spritzer, the drink will have an alcohol content around 6 percent ABV. It really is one of the gentlest drinks you can mix up. What Makes a White Wine Sweet? What's a Delicious Recipe for Peach White Wine Sangria?